Do you like Stop: Trump vs Kim Jong-un? Share it with your friends. 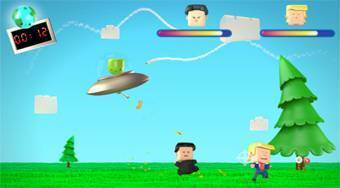 Stop: Trump vs Kim Jong-un is a great shooter in which your mission is to help the alien in the flying saucer stop the raid of US President Donald Trump and North Korean leader Kim-Chong-un. Try to eliminate the two running leaders before the time runs out, and save them from their planet Earth.